Zodiac Casino is one of our recommended Microgaming Casinos accepting Canadian players. Of course UK and EU players are also welcome to play for real. The bonus offers at Zodiac Casino have been improved since we last reviewed them. New players can claim a generous $20 in free casino money for only a $1 deposit when they join Zodiac Casino. That's a 2000% bonus! The bonus is easy to claim, simply register as a real player and make your $1 deposit. The $20 in free casino money will be credited to your account. If you had fun playing with your $20 free you can claim up to 4 more free bonuses. With the first of the four free bonuses players can claim a 100% Match Bonus up to $100. With the second part of the bonus offer players can claim a 50% Match Bonus up to $80. With the third and fourth deposits players can claim another 50% Match Bonus up to $150! Zodiac Casino offers over 490 Bonus slots, traditional slots, progressive slots, blackjack, video poker, roulette, keno and speciality games. You can easily access all the casino games from the casino lobby after joining. If you don't want to install the full casino Zodiac offers players a flash verion. Zodiac Casino has a big list of deposit and withdrawal options, however they aren't available until the casino is installed. Some of the more popular methods include Credit and Debit Cards, Click2Pay, EZIPay, Wire Transfer, NETeller, UseMyBank, InstaDebit, MoneyBookers/Sktill, EcoCard and Direct Bank Transfer. While most players can join Zodiac Casino visitors from Australia, Belgium, France, Spain, South Africa and USA are prohibited from joining the casino. Consider these other Microgaming Casino Bonuses. If you've never played a Microgaming Casino check out the Microgaming Casino Lobby and Jackpot Thermometer. 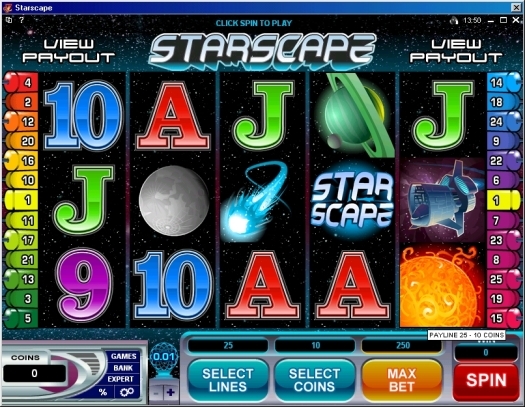 Starscape is a 5 reel, 25 payline bonus slot with a top prize of 70,000 coins! You can wager 1¢ through $1 up to 250 coins. The Galaxy Match Bonus Round is triggered when 3 or more spacecraft scatter symbols appear on any of the 5 reels. In the Match bonus round the galaxy is divided into twenty-five blocks. Behind twenty-four blocks are symbols. In all there are six different types of symbols. You keep choosing blocks until you reveal four matching symbols. Behind one block is a multiplier symbol. If you find the multiplier your bonus win amount is tripled. Top prize in the Galaxy Match Bonus is 37,500 coins. Best Features: The Starscape wild symbol automatically doubles all payline wins when combined with all other reel symbols except scatters. Not only does 3 scatter symbols trigger the Match Bonus Round but also pay 3 times the total coin wager. The Winning at the Slots guide to playing online casinos includes over 50 online casinos that offer hundreds of free cash bonuses. Download it free or visit our recommended online casinos. Webmasters Join the Winning at the Slots affiliate program. It's free to join and you can earn a 75% commission.